برای خرید کتاب Thoracic Imaging The Requisites, 3e (Requisites in Radiology) با گیگاپیپر مکاتبه کنید. Now in its 3rd Edition, this outstanding volume by Dr. Jo-Anne O. Shepard in the popular Requisites series thoroughly covers the fast-changing field of chest imaging. Ideal for residency, clinical practice, and board certification, it covers the full range of basic and advanced modalities used in thoracic imaging including digital radiography, chest fluoroscopy, CT, PET, and MRI. 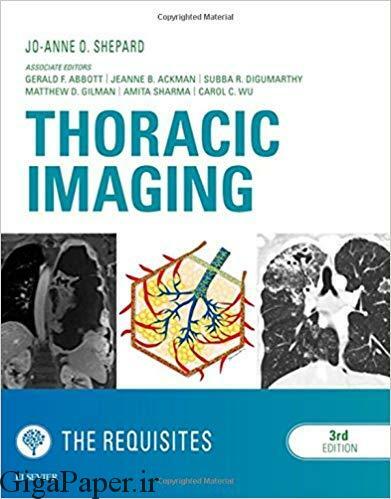 Compact and authoritative, Thoracic Imaging: The Requisites provides the up-to-date conceptual, factual, and interpretive information you need for success on exams and in clinical practice. Focuses on essentials to pass the certifying board exam and ensure accurate diagnoses in clinical practice. Approximately 90% of the more than 1,000 images are new, reflecting the very latest thoracic imaging modalities and techniques. Many diagrams and images are also now in full color. New material on acute and critical care including post-operative complications, trauma, ICU diagnosis, and implantable devices. More interventional content including diagnostic biopsy techniques, fiducial placement to aid VATs resection, and ablative therapies including microwave and cryoablation. Expanded and updated lung cancer coverage including new tumor staging, new surgical and bronchoscopic staging techniques, and lung cancer screening. New information on thoracic MRI indications, protocols, and case material outlining how MRI adds specificity to tissue characterization of masses and extent of disease. Expanded content on interstitial lung disease including color anatomic drawings and extensive new case material. Current pulmonary nodule management strategies including the updated 2017 Fleischner criteria for incidental nodules. New editor, authors, and section editors bring a fresh perspective to this completely revised book.